Watercolor sketch in Aquabee Super Deluxe 808 sketchbook. 6"x9" (15.2 x 22.9 cm). I found myself, on the morning of Christmas Eve, having time off work and a lazy morning ahead of me. So, I took the opportunity to make a little sketch. 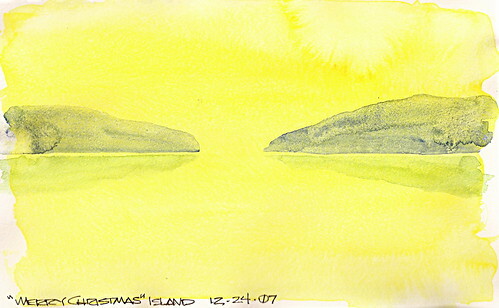 I didn't know what to title it, so my wife suggested "Merry Christmas Island." There you have it. And to all: Have a very Merry Christmas.